When you’re in the market for a new bowrider boat, you’ll want to soak up as much information as possible before you take the plunge and make an investment. Here at Bassett Yacht & Boat Sales, we do our very best to educate our customers when they’re shopping for a new product. We’ve put together this helpful guide with some important information on bowrider boats. Once you’re ready to start exploring your options, be sure to stop by one of our convenient dealership locations for assistance from our friendly staff. You can find us in Old Saybrook, CT, Stamford, CT, and Springfield, MA. Some essential factors to consider include performance, capacity, and budget. The performance you receive from your bowrider boat will depend largely on the engine size. In addition, engine size also affects how expensive your purchase will be. When you’re on a budget, you might not be able to get the biggest engine out there. At the same time, smaller engines are easier to handle and maintain so that’s not always a bad thing. If you can afford it and want that extra kick of power on the water, go with a bigger engine. As for capacity, consider the maximum size of your boating party. Maybe you only plan to take your close family members on your bowrider boat. On the other hand, maybe you’ll be hosting some gatherings on the water with your friends for those special occasions. For safety and comfort reasons, you should ensure that you choose a model where everyone will have a place to sit while the boat is in motion. Remember to visit us at Bassett Yacht & Boat Sales when you’re ready to start checking out some amazing bowrider boats! We’re happy to also offer parts and service departments to our customers. We have three convenient locations in Old Saybrook, CT, Stamford, CT, and Springfield, MA. For over 30 years, Monterey has been providing boats that set the bar in quality, design, and ease of maintenance. 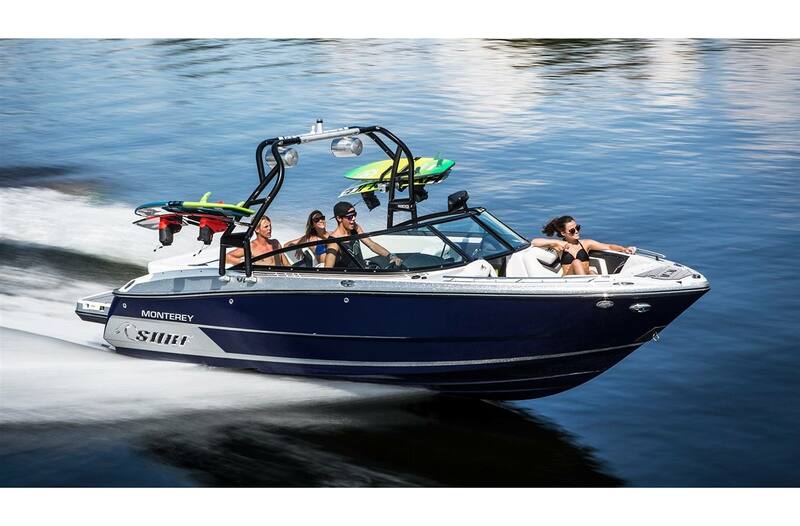 They have bowrider options in the M Series, Outboard, Sport, Super Sport, and Surf models. Without a doubt, their bowrider boats have become a personal favorite among all water-enthusiasts.